My children love brownies and I admit…so do I! Bite sized brownies are even more fun to eat. 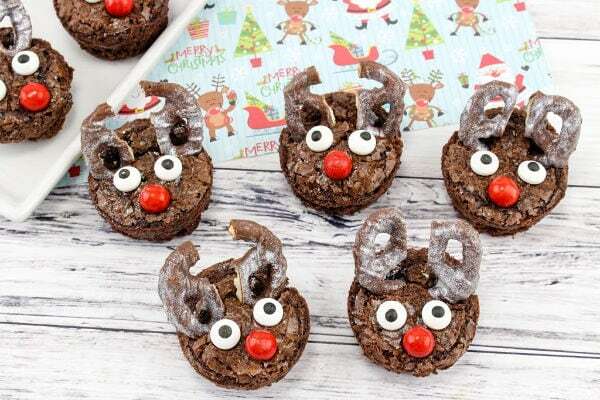 The fact that these are reindeer brownie snacks brings a huge smile to little faces. Kids can even help make these adorable little Christmas treats. I love quick, easy and simple when it comes to the kitchen. 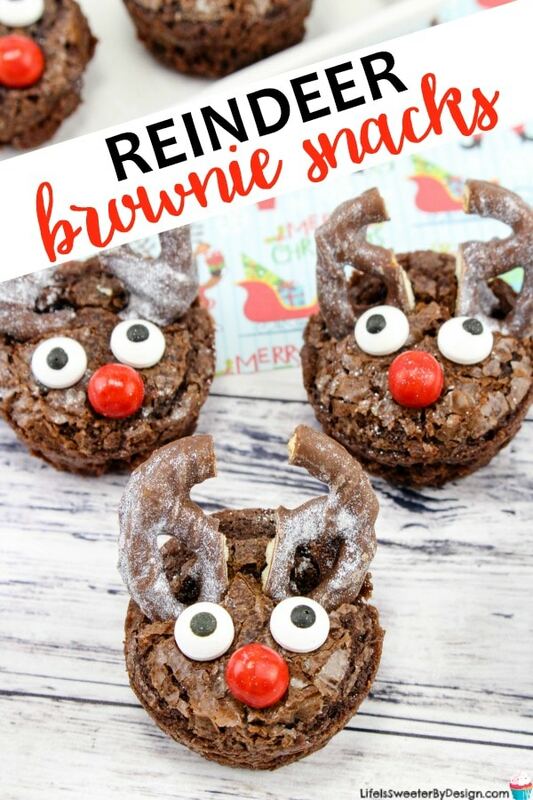 These Reindeer Brownie Snacks fall into that category because they use a brownie mix! If you prefer to make your brownies homemade feel free to use your favorite brownie recipe. First mix up the brownie mix according to the package directions. Grab a mini muffin pan and spray it with nonstick cooking spray really well. Then spoon brownie batter into each mini muffin cup. Bake the mini brownies according to the brownie package. Once the brownie bites are done cooking, allow them to cool before removing from the pan. Now it is time to make some reindeer antlers look like they are covered in SNOW! This look is easy to achieve by using silver edible glitter dust . Take the chocolate covered pretzels and cut them in half. Spray the edible glitter onto the “antlers” or you can paint it on. Some people find that using a small paint brush works best. Now push two pretzel antlers into the brownie very gently. Add 2 eyes and a red nose by just lightly pushing them into the brownie as well. Another easy option would be to put a tiny bit of frosting onto the back if you have a tube on hand. 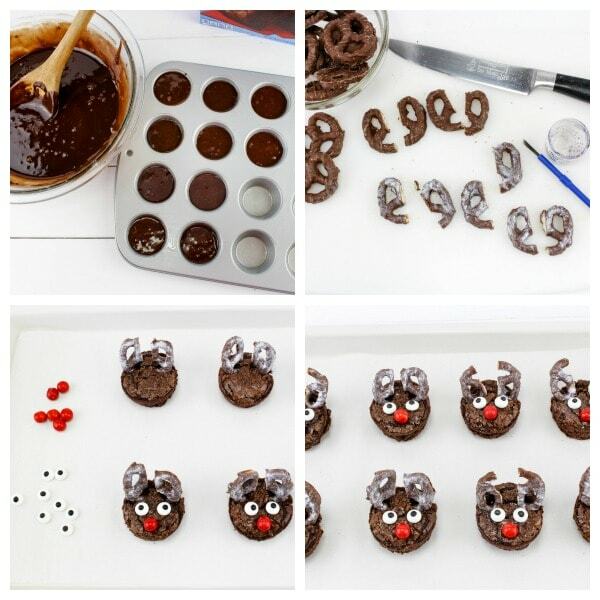 You have just created some Rudolph the Red Nosed Reindeer Brownie Snacks! How cute and quick were these to make! I am hooked on reindeer this season and have so many fun ideas here on the blog for reindeer lovers! Be sure to check out this huge list of reindeer treats and try your hand at a REINDEER themed party! I also have some adorable reindeer color pages you can use at your party….and another big list of all sorts of free reindeer printables. Don't forget to grab some reindeer party supplies and everyone can even wear reindeer antlers . Hope your December is as magical as flying reindeer! 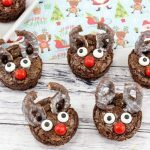 These Reindeer Brownie Snacks are fun, bite sized brownies that look just like Rudolph the Red Nosed Reindeer! Make brownies according to package directions. Spoon mixture into a 24-count mini cupcake pan that has been sprayed with nonstick cooking spray. Bake according to package directions. Let cool slightly before removing them from the pan. Take the chocolate covered pretzels and cut them in half. Sprinkle or paint on the silver edible glitter dust. This makes it look like Rudolph has snow on his antlers. Gently insert 2 antlers on the top of brownie. Push in 2 eyes and a red candy sixlet (nose) as well.